"silent movies" "silent film" "silent era"
Lowell Sherman came from an acting family and had many stage appearances to his credit from the age of four through the years prior to 1920. Born in San Francisco Oct. 11, 1888. His first film appearance was as a friend to Mary Pickford and James Kirkwood in "Behind the Scenes" (1914). Although he played a variety of roles in the early years, it wasn't long before he found his forté as a scoundrel and villain. This character was solidified with his roles in "Yes or No" (1920 where he lured Norma Talmadge away from her husband and then abandoned her, and in "Way Down East" (1920) in which he dupes Lillian Gish into a fake marriage and gets her pregnant. He played everything from a killer, to a Russian lusting after mother and daughter to a German spy. One of his most famous roles was in Garbo's "The Divine Woman" (1928) where he steals her away from Lars Hanson. Sherman was also able to play the scoundrel and, at the same time, instill humor into the character. In "The Garden of Eden" he tries to seduce Corinne Griffith attempting to force himself on her, but when the lights come on, he actually has grabbed the motherly Louise Dresser! With hair awry and clothes askew, Sherman makes a comical figure as he tries to maintain his pomposity. Another such role is in "A Lady of Chance" where he plays a shady figure from Norma Shearer's background constantly threatening her happiness with the innocent John Mack Brown. 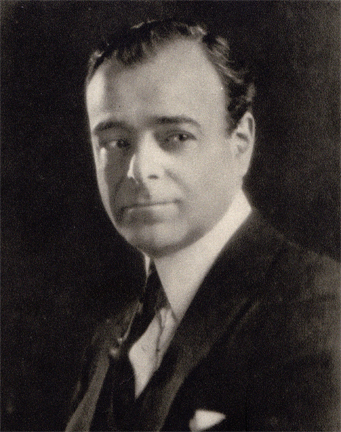 Sherman made 53 films between 1914 and 1932, but he also turned to directing with 14 films to his credit between 1930 and 1935. One unfortunate point in Sherman's career was that he was Fatty Arbuckle's partner in the infamous Labor Day party in 1921 which resulted in the death of Virginia Rappé and Arbuckle's ban from the screen. Famous Players-Lasky canceled Sherman's contract as a result of this, but it wasn't long before he was back on the screen. He was married to Pauline Garon from 1926 to 1930 and then married Helene Costello. Sherman died Dec. 28, 1934, from pneumonia.